As the postmodern takeover of American education nears completion, the practice of assessing student performance with letter grades is under attack. Education disrupters claim grades and GPAs create an unfair academic hierarchy and put undue pressure on high-achieving students, leaving the rest mired in low self-esteem. Combine these objections with the political insistence that all students graduate “college ready” and armed with “21st-century skills,” and a revolution in assessment is well under way. Many elementary-school teachers years ago abandoned letter grades in reading, writing and arithmetic. Instead they write progress reports that assess, on a scale of 1-3 (or 1-4), the student’s proficiency in various skills. The reports typically indicate whether the student has achieved competency, is “progressing” toward competency, or has not made progress. This type of “standards-based grading” (as it is called) represents more than a change in nomenclature. Whereas letter grades (or numeric percentages) measure the work a student has completed, the new system is concerned primarily with what the student will be able to do by year’s end. Teachers expect most students to be “progressing” toward the standard on their first report and then to have “met” the standard on their last. This method of assessment makes even less sense in high school, where students are savvy enough to know that they need not work hard in October to show proficiency in June. Nevertheless, standards-based grading (or its cousin, “competency-based grading”) may be coming to a district near you. It has taken root already in schools from Maine to Idaho to Florida. Instead of one letter grade in Spanish and another in social studies, the transcript might say a student can “express ideas in two or more languages” and has “the social and intellectual skills to navigate effectively across cultures.” It might include a link to a video of the student speaking Spanish while providing hurricane relief in Puerto Rico. Never mind that a high-schooler raised in a bilingual home with an interest in community service might demonstrate mastery of these skills without doing a stitch of homework. Neither of these alternatives to traditional grading says much about the abilities of a student qua student or whether he has learned anything of substance. 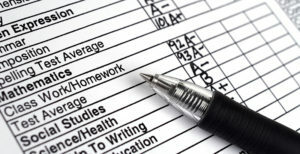 Neither takes into account effort, ability to meet deadlines, or level of engagement—all of which are captured by traditional letter grades, and all of which are relevant to success in college and the “real world.” Moreover, because standards can vary wildly, the new assessments make comparing schools and students almost impossible. But perhaps that is the point. Traditional grades aren’t perfect, and critics of grade inflation are right to object to that practice. But grades are a more comprehensible and holistic measure of achievement than newfangled alternatives. Perhaps most important, they provide a way for bright and hardworking students from lower-income families to prove themselves and win admission to the nation’s elite colleges. Without grades, class rankings and honor rolls, public-school kids who lack family or boarding-school connections are likely to be left behind. Some people would rather give every child a trophy than let poor performers feel bad about themselves. But anyone who wants to limit the influence of money, connections and bias on students’ post-school prospects should fight like hell to keep grades. Ms. Braceras is a senior fellow with the Independent Women’s Forum. Appeared in the January 30, 2018 print edition of the Wall Street Journal.